This week I got adventurous and did a vlog instead of a blog. I forget how much work they are! I barely got my "weekly" post up! It’s been a full on week. Totally full on, um, I do have some notes, so if I’m looking away that’s why, I’m just checking what I’m saying. Um, ‘cos I’ve got so much to get through, it’s been crazy! Ah, yeah. Um, If there is some odd pauses, in this video it’s because, um, I’m hoping to insert some other pictures and a quick video I took with Rose this morning, so bear with me ‘cos I’m still learning and editing it is going to be fun today! 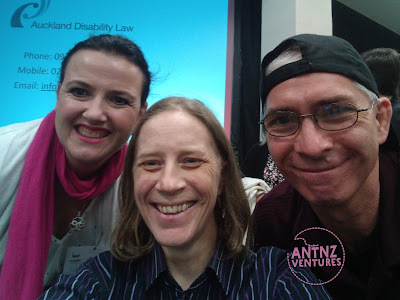 Anyway… um… this week… wow… started off with the Disability Matters Conference down in Otago and we had some cool stuff coming outta there… thank you Huhana, um, for giving us updates throughout the conference while you were there. It’s generated some good discussion, and I’ll talk a little bit more about some of the discussion that was had a bit later on in this video. 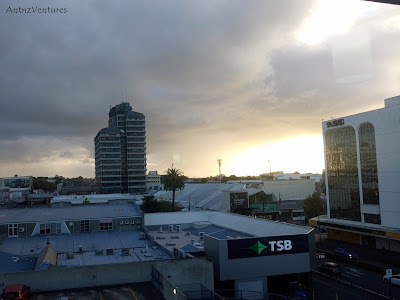 Um, for me it was the last travel in a little while for, down to Wellington for System Transformation, um, Working Groups that I’ve been a part of. Um, It’s been full on, there’s been some frustration with travel. Yeah, Air New Zealand, you’re great, but you need to pick up your game between your Special Assistance (pause) requests and actually getting it to happen on the ground. Um, some of it’s really easy, like adding some extra drop boxes in your computer system; because I’m not a visually impaired person with a golden retriever. I don’t know how many times I’ve had to say it in the last 3 weeks travelling with you. But I’m not; I am somebody with a slight mobility impairment that uses a black Labrador, who is an Assistance Dog. If you could get that, that would be awesome! Um, not only that, but you know, other people who have been travelling haven’t had, their special, um, accommodations met, even when they’ve been quite specific in what they’re asking for. And I guess that’s one of the un-intended… (pause)... I dunno… Consequences… of, um, the System Transformation and having all the Working Groups on, ‘cos you’re getting a whole lotta people with access needs all in the same place at once. Um, yeah. System Transformation, it’s been full on, and I’ve only been part of two working groups so far, um, one more to come. Um, but there’s over 300 people across all these working groups, so it’s a huge job that we’re, we’re all trying to all trying to put our little piece of the cog, of the machine into. Um, and hopefully we’re getting somewhere. I feel like the groups I’ve been a part of have been making some real progress, and, hopefully when we roll out in July, um, we’re gonna have things pretty dialed in. There’s always going to be issues when you roll out something new; um, and we’re just going to have to play it by ear, see how it goes. If it doesn’t work, adapt, it’s what we’ve got to do; um, and that’s life in general as well. So System Transformation stuff; I’m kinda over the urban travel, Ben’s over the urban travel. Um. And it’s been a real experience for the Ministry of Health learning how to fit us all in as well I think. So I think that’s it with the System Transformation stuff [Red Caption “I am Lying…” appears]. Networking Group has been really interesting looking at how we network, um, within our community and the broader community. So, (pause), one of the principles is “Mainstream First” for EGL, um, and that means trying to get the generalized services onto it around disability issues as well and not having to go to disability specific, um, provider for every single thing we need. Um, and I think we’ve made some real progress in how we are going to do that. So that working groups, um, I think we’ve got another couple of meetings to come in the New Year, um, but we’ve done a massive amount of work, um, heading, um, heading into the New Year. Christmas, New Years, we’re just not going to get a chance to, to meet that often, um, until the New Year, to get more of this work done. We do have a Regional Leadership Group Meeting coming up. Um, and with that we’ve got a, we’ve got stuff coming out of the Working Groups to look at before we go into that, so for me it’s really cool to see stuff coming out of the other working groups as well. Um, (pause, checking notes). Pride. It’s Disability Pride Week. Yay! Go people with disabilities! Um, and that’s cool, and I’ve been down at Easie Living Center with Rose this morning, um, talking about what they are doing down there, um, for International Day for People with Disability. Antnz: Hey everyone, I’m here with Rose down at the Easie Living Center on December the third, International Day for Persons with Disabilities. Um, Rose, what are (mumble) we doing down here at the Easie Living today?? Antnz: Fantastic, Awesome… Has it been a lot of work getting this together Rose? Rose: Yeah, but… but no too much… it’s been great, it’s the one thing I’ve wanted to do, I’ve really wanted to celebrate today. Antnz: Yup, so thanks for the opportunity, um, to come down and talk to people about the system transformation as well. Um, and I’ve really enjoyed the crafts you’ve got down here as well, those screen printed shirts are AWESOME! Rose: I know! And the amount of effort too, also in the handmade cards, and even the um, the wheat bags. Antnz: Lots of people down here just hanging out, so just come on down guys, um, and have a really good, ah, day for people with disabilities really… just enjoy it, anything you want to close with Rose? Rose: No, just celebrate, let’s celebrate OUR day. Um. There’s been lots of talk about language this week, with the term “access citizen” coming out from the Disability Matters conference in Otago. It’s just another language, PC -gone mad, term in my opinion, um, although I totally get that what language we use is important I think we have too many arguments about whether it’s, people with disabilities, disabled people, access citizens. Let’s just get real people, let’s have conversations, let’s stop being so argumentative and PC about some of the terminology we use, because it’s cutting off conversations with the general population. As I was travelling, one of the ground crew, I could tell he was trying to ask me how, how much functional ability I had with getting on and off the plane. And I could tell he was nervous, and I made some smart crack about him having his head bitten off by some over-sensitive person with a disability in the past, and he cracked a bit of a grin, and he went “yeah, and I never know how to have these conversations ‘cos some people get really pissed off”. I totally get where he is coming from, I think some of us are too precious, and that we just need to roll with it, because if we don’t have those conversations with people, it puts up further barriers. We’re supposed to be celebrating today people, celebrating the diversity within our community, and it is huge. I’m only one part of that, Jade’s only one part of that, Rose is only one part of that, Mike’s only one part of that, Ingrid’s one part of that, Huhana’s one part of that, all our allies, our whanau, all those with disability themselves; the scope of our community is huge and let’s celebrate it today because we do have a lot to celebrate. Especially here in New Zealand. You know, we’ve got it easy compared to some places, and I’m grateful for that. 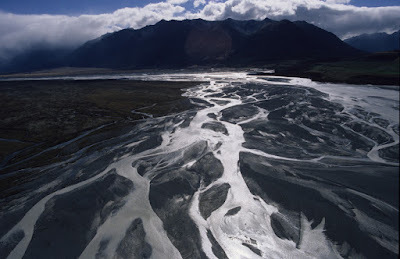 I’m not saying that New Zealand has is perfect, because we don’t. We are really messed up in a lot of areas, and some of us are trying to work towards change for that. So… let’s celebrate today; let’s celebrate the fact that we have come a long way, acknowledge the fact that we’ve got still a lot of work to do; but let’s celebrate all the successes that we’ve had, all the things that happened in a positive manner this year. For me personally things like getting out solo again, you know, for me that’s huge. For some people that’s transitioning from home to their own flat, let’s celebrate all those achievements and make sure that we keep working towards more. Right, and in saying that, I’m going to talk a little bit about future stuff. Yup, I had a big plan this year, to do one adventure a month; and it hasn’t always worked out that way, especially since I decided to jump on board with so many of the System Transformation Working Groups. And I don’t regret jumping on any of them, absolutely not. They’ve been hard work, um, it means I’ve had to put some outside plans on hold. So summers going to be fun guys, ‘cos I’ve got trips coming up. Um. First one is going to be within the next couple of weeks, just because I’m over urban travel man. I’ve done so many trips in the past couple of months and it’s all been into concrete and I’m done. I need some bush time. So I’m going to head away for a couple of days in the next couple of weeks just to, to, to, chill and get away from it all. Um. Other things coming up this summer is I want to start ticking off some more of Te Araroa; and one of those is going to be actually completing Burton’s Track, which I started earlier in the year and had to turn around, um, ‘cos the conditions weren’t so great. So I’ve got that going on, um, there’s some climbing stuff I’m going have an aim for; but my big thing this summer is to try and get out and do some more tramping. ‘Cos I love the hills and they are calling my name…. Um, that’s it for now guys, have a fabulous week, um, take, just take some time to enjoy yourself, take some time to look after yourself, and whatever you do stay safe. Take care and I’ll catch you again.